Posted on November 29, 2016 by thelostlighthouse	in Gaming, Podcast, Total Reroll and tagged 5th Edition, 5th edition D&D, actual play, D&D, DnD, Dungeons & Dragons, Dungeons and Dragons, fantasy western, gaming, pen and paper RPG, podcast, real play, role playing game, RPG, thelostlighthouse, TLL, tllgaming, tllpodcast, Total Reroll, Total Reroll Equinox, Western, Wizards of the Coast. 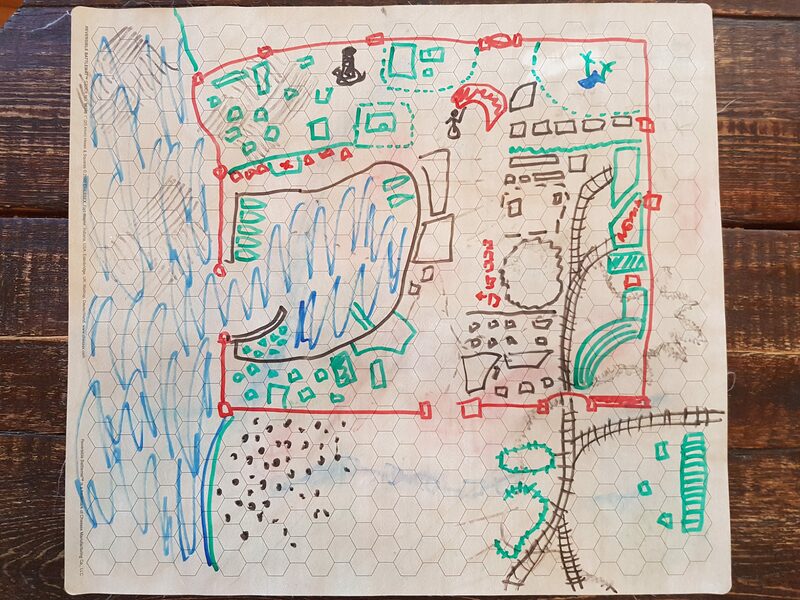 Shep, Ragnar, Pity Jyoti, Roscoe and Badger have escaped their captors at the Ogre’s Hand slave camp and arrived at the nearby town of Venture. Roscoe immediately started trouble with the town guard. This is already going very well. The town of Venture, with our approach from the south by the train tracks, the Colosseum in the bottom right hand corner of the town, an oasis in the top right, the nicer area to the top left and the port in the centre. We all go to the pub above next to the docks (green with a red X in it).